Phonemic awareness is the ability to distinguish and manipulate phonemes, the smallest units of speech sound that can carry a meaning. In English there are 44 of these sounds. The awareness can be demonstrated in the ability to isolate, blend and otherwise manipulate the essential sounds of language—for example by recognizing a set of words all beginning with the /h/ sound or isolating a sound at the beginning, middle or end of word. It does not require spelling or even the use of letters. Linguistics: the scientific study of language and its structure. 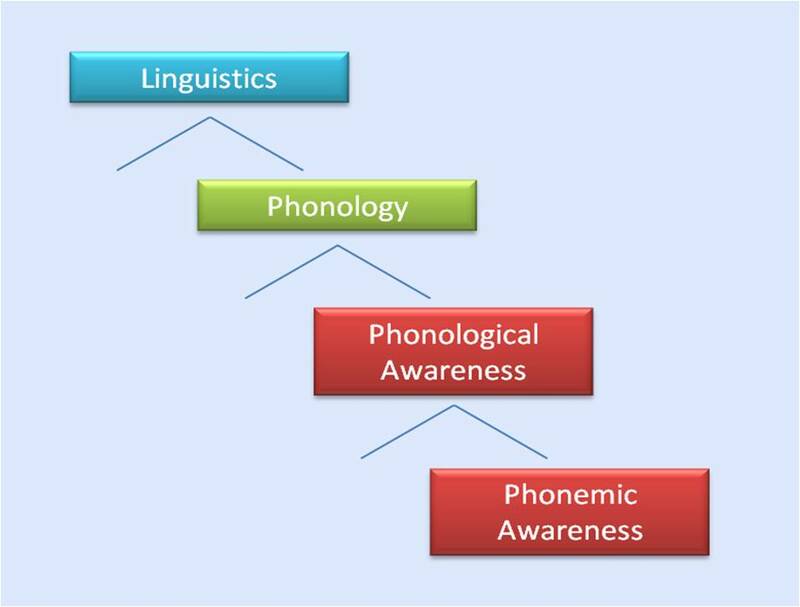 Phonology: the branch of linguistics concerned with the study of speech sounds and patterns. Phonological awareness: the ability to identify and manipulate the sounds of speech, separate from their meaning. It includes recognition of syllables and rhymes. "Phonological awareness is the ability to listen inside a word"
But isn't it just phonics? No, phonics is about the relationship between letters and sounds whereas phonemic awareness is strictly about sounds, does not require a student to know the alphabet, or even be able to identify a single letter. For example asking a child which word results from taking the /m/ sound off the end of the word 'farm' would be a test of their phonemic awareness. Asking him or her to sound out the word by looking at the letters would be a test of phonics. In a 2012 study of the relationship between phonemic awareness, rhyme awareness, short-term memory and children's reading skills, Melby and Lervag et al. found the phonemic awareness was the strongest predictor. The authors wrote of the "pivotal role of phonemic awareness as predictor of individual differences in reading development." In 2000, the U.S National Reading Panel found that "teaching children to manipulate phonemes in words was highly effective under a variety of teaching conditions with a variety of learners across a range of grade and age levels and that teaching phonemic awareness (PA) to children significantly improves their reading more than instruction that lacks any attention to PA."
In contrast, alternative approaches to teaching reading emphasize context, vocabulary and meaning, sometimes referred to as the whole language approach, now widely believed to be inferior to explicit phonemic and phonic instruction. Rime: Derived from the Germanic rim, it means a sequence or series. More specifically it refers to a part of a word with a particular spelling pattern, beginning with a vowel sound and ending before the next vowel sound in the word. For example in the words hog, dog and fog the letters 'og' are the rimes. The initial letters of the word (h, d, f) are known as the 'onset'. Rhyme: A correspondence of sounds between words. If two words contain similar sounds, usually at the beginning or end, then we say that they Rhyme. For example the words core, door and four all rhyme but do not contain the same rime. In summary, words that rhyme don't always have the same rime. Got it? Below are the specific skills that someone with phonemic awareness should be able to demonstrate. Skills are listed below by the approximate age they usually appear. Children have to become aware that speech is made up of discrete knowable words, mentally parsing them where one ends and the next begins. This occurs naturally but it is a surprisingly difficult learning task, one a toddler will not even recall mastering. Those studying a second language readily understand just how spoken words can stick together. Progress is when a garble of formerly mysterious sound is magically deciphered into a series of meaningful words. We just get used to the magic. Awareness of rhyme may be revealed though their enjoyment of rhyming verses read to them from storybooks, playful use of rhymes in songs, or from being able to actually identify rhymes in speech or even text. Syllable awareness is an understanding that words are composed of smaller sound chunks. Children can demonstrate knowledge of syllables by clapping out words such as hip-o-pot-a-mus. If they clap the right number of times, they are aware of syllables. Syllables are not phonemes, but awareness of them indicates a knowledge that words are composed of discrete sounds which can later be isolated and manipulated. Building on their abilities to identify rhymes and syllables allows young readers to demonstrate rhyme generation involving manipulation of both the onset and rime. (See side box for definitions). If a child can identify the first sound in the word cat or the last sound in the word dog or identify a common phoneme in a group of words like bit, sat and wet, then they have demonstrated this skill. Blending is the ability to assemble a word from its onset and rime (/b/ + /ug/ = bug) or from its phonemes, such as the sounds /c/ /a/ /p/ blending to form the word cap. Segmenting is simply reversing the process by asking students to break the words 'bug' or 'cap' down into their syllables and sounds. This skill involves isolating where in a word a specific sound resides. For example, in the word 'bug' where is the /g/ sound located—at the beginning, middle or end? The most difficulty and last kind of isolation to be learned is identifying phonemes in the middle of words. Remember that this exercise is done orally, not using letters on paper and is harder for young children than it sounds. If we remove the last sound from the word 'cart', what word are we left with? If a child understands that the word 'car' is left over then they can delete phonemes. This skill involves being able to replace one sound in a word with another and recognizing the new meaning. For example, if we replace the /m/ sound in the word stem with the /p/ sound, what new word do we have? How can you tell when a child is struggling with phonemic awareness? There are some very simple, informal methods that parents and teachers can use as well as formal diagnostic tests administered by professionals. Read out loud: For children in kindergarten or the first grade, the easiest way to reveal problems with phoneme awareness is by having them read of a list of words out loud. Ideally the list should be made up of age appropriate words which have not previously been practiced, free of context clues and pictures. If their reading is slow and errors are frequent, it may indicate a phoneme awareness problem. It is harder for parents of an only child to know what constitutes 'slow' but parents with more than one child and all teachers quickly learn how typical students read. Importantly, the errors made won't be random. Those with weak phonemic awareness skills will guess at words based on shape and similarity of letters, because they cannot sound it out. There will be letter (b for d) and word (saw for was) reversals, but more common will be odd guesses such as reading lunch for bunch, except for expect. Rhyming games: Ask the child to identify or create rhymes—tasks which can be done orally. Asked to generate words that rhyme with truck, a child with dyslexia may reply car and bus rather than duck or luck. The inability to complete this seemingly easy task is a very reliable indicator of dyslexia. There are several diagnostic tests for awareness of phonemes. Dynamic Indicators of Basis Early Literacy Skills (DIBELS), Comprehensive Test of Phonological Processing (CTOPP-2), Test of Phonemic Awareness (TOPA), the Yopp Singer Test of Phoneme Segmentation, Aimsweb Test of Early Literacy and others. For more information see our dyslexia testing page. These test should be administered by a qualified psychologist or assessor trained to administer them. Better reading programs explicitly teach phonemic awareness. How do they do it? By employing creative, fun, auditory and often visual exercises which help develop each of the skills above. Below are two helpful resources. 1) Essential Strategies for Teaching Phonemic Awareness from the book 50 Reading Strategies for K-8 Learners from Sage Publications. A helpful book for teachers of kindergarten and elementary students. 2) The Reading Rockets website features helpful ideas for classroom activities. Every teacher of beginning readers should be aware of the importance of phonemic awareness, have their students assessed for it and be able to provide interventions for those students lagging in development. By fostering this ability during the critical window of early language development, teachers can make a lifelong difference for their students.